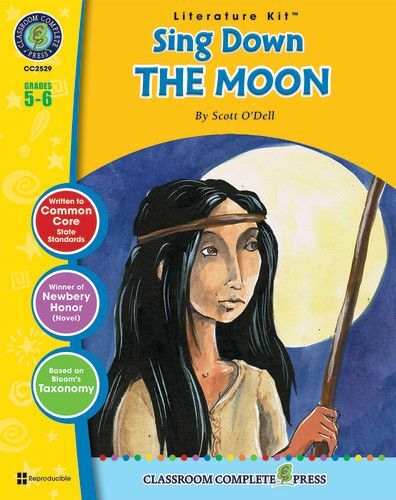 Gain a fresh perspective of the migration of the Navaho people through the eyes of a young girl. Gain a fresh perspective of the migration of the Navaho people through the eyes of a young girl. Unique and varied materials supplement a study of this novel. Students are asked to describe what they already know of the Navaho people. Write the name of the character next to each quote from the story. Identify the cause or effect of each event in the book. Finish off sentences with vocabulary words found in the novel. Explain how Rosita was able to adapt to life in a town whereas Bright Morning was not. Students do some research to find the meaning and origin of their name. Gather facts and complete a character analysis of Tall Boy. Aligned to your State Standards, additional crossword, word search, comprehension quiz and answer key are also included. 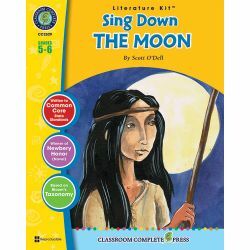 About the Novel: Sing Down the Moon is a Newbery Honor-winning story told through the perspective of a young Navaho girl. Fourteen-year-old Bright Morning takes her family's sheep to graze one spring day. While tending to the flock, she is captured by Spanish Slavers and sold into service. Fortunately, she is able to escape and return home. Unfortunately, her home is promptly taken from her as her tribe is forced out of their canyon in Arizona and relocated to Fort Sumner in New Mexico. The long walk of the Navaho people is described through the eyes of Bright Morning, who sees the migration as the end of her people.